Q: In its World Economic Outlook report issued on April 9, the International Monetary Fund (IMF) downgraded its outlook for global economic growth to 3.3% this year down from 3.5% it had forecasted in January, and upgraded China's economic growth outlook to 6.3% from 6.2%. What's your comment? A: We noted the relevant report. This is the second time for the IMF to downgrade its forecast for global economic growth in this year, which shows that the downward pressure on global economy is still increasing. Against such a backdrop, China's economic operation has maintained overall stability and made steady progress with good momentum, which is there for all to see. Despite some uncertainties and instabilities in the external environment, China's economic fundamentals will remain sound over the long term. It has acquired great resilience, huge potantial and broad room for maneuver. The IMF's upgrade of China's economic outlook indicates that the international community has full confidence that the Chinese economy can sustain medium-high speed growth and move to a medium-high level of development. Q: In recent days, Philippine officials have said that the South China Sea belongs to the Philippines. China took it away and the Philippines will take it back. China has no business in the EEZ of the Philippines. What is your comment? A: We have taken note of those remarks made by the Philippine officials. The Nansha Islands are within China's territory, for which we have sufficient historical and legal basis. For thousands of years, Chinese fishermen have been fishing in these waters in the South China Sea. Their rights should not be challenged. It is China's consistent belief that the relevant disputes related to the South China Sea shall be resolved through negotiations between China and countries directly concerned including the Philippines, and we are committed to upholding peace and stability in the South China Sea in concert with other regional countries. Thanks to the personal efforts of the two leaders, China and the Philippines have returned to the right track of properly handling and resolving the relevant disputes through negotiation and consultation. The situation in the South China Sea is generally stable, and steady progress has been made in the consultations on the COC. The China-Philippines relationship has experienced a turnaround, been consolidated and elevated to a comprehensive strategic cooperative one. This positive momentum is hard-won and shall be all the more cherished. We hope that the Philippine side can join us in properly managing the South China Sea issue, upholding peace and tranquility on the sea, and bringing more benefits to the two peoples. We hope that the Philippine side will join us in strictly implementing the important consensus reached by the two leaders on properly resolving the South China Sea issue and safeguarding peace and stability in the South China Sea. Q: The inauguration ceremony of the China-Africa Institute was held in Beijing on April 9. President Xi sent a congratulatory letter to the event. Yang Jiechi, member of the Political Bureau of the Central Committee of the Communist Party of China and Director of the Office of the Foreign Affairs Commission of the CPC Central Committee, read President Xi's congratulatory letter at the inauguration and delivered a speech. Why does China attach so much importance to this institute? A: Last September, the Beijing Summit of the Forum on China-Africa Cooperation (FOCAC) was successfully held during which the two sides agreed to jointly implement the eight major initiatives for China-Africa cooperation. This year kicks off the implementation of the FOCAC outcomes. The establishment of the China-Africa Institute is an important early harvest in the implementation of the FOCAC outcomes in the sector of people-to-people exchanges. President Xi's congratulatory letter read out by Director Yang fully testifies to the care and support from President Xi himself and the Chinese side to China-Africa relations and China-Africa people-to-people exchanges. The African side also attaches great importance to the establishment of the China-Africa Institute. Dignitaries attended the inauguration ceremony include former President of Mozambique Joaquim Chissano and the African Union Commissioner for Human Resources, Science and Technology, diplomats, and representatives of African academic institutes, think tanks and media from over 40 African countries. The African side spoke highly of President Xi Jinping's congratulatory letter and said that they stand ready to work with China to build a closer China-Africa community of a shared future, support the work of the China-Africa Institute, and make greater contributions to strengthening bilateral people-to-people exchanges, enhancing mutual understanding and deepening China-Africa friendship. We hope that scholars and experts from China, Africa and other countries will make good use of the China-Africa Institute to strengthen exchanges and cooperation between the think tanks of the two sides, enhance mutual understanding between the two peoples and mutual learning between the two civilizations, provide good ideas and advice for deepening China-Africa comprehensive strategic cooperative partnership so that the international community will have a fair view on China, Africa and China-Africa cooperation. Q: The US Treasury Secretary Mnuchin said yesterday that the US and China pretty much agreed to open enforcement offices in each other's countries as part of any trade deal. Is that China's understanding too? Might you have any comment? A: China and the US have conducted nine rounds of trade talks and did make substantial progress in the latest one. We hope that the two sides will continue to make efforts to properly resolve the concerns of each other and reach a deal that is agreeable to both sides on the basis of mutual respect, equality and mutual benefit. This serves the interests of both sides and is also conducive to world economy. Regarding the specifics of the text, the certain areas and details it involves, we noted that there have been some remarks from the US side from time to time, and I would like to refer you to the competent Chinese authority for more information. Q: US Secretary of State Mike Pompeo said that it is necessary to include China, which significantly expanded its nuclear program in recent years, into new Strategic Arms Reduction Treaty (New START). This treaty was signed between Russia and the US in 2010 and is going to expire in two years. What's China's comment on his remarks? Is China ready to engage in talks with the US and Russia about the new START treaty? A: The Treaty between the US and the Russia on Measures for the Further Reduction and Limitation of Strategic Offensive Arms, also known as the New START Treaty, is an important bilateral nuclear disarmament arrangement between the US and Russia. The issue of its extension has drawn a lot of attention from the international community, as it concerns the strategic security relations between the US and Russia and bears on global strategic stability. 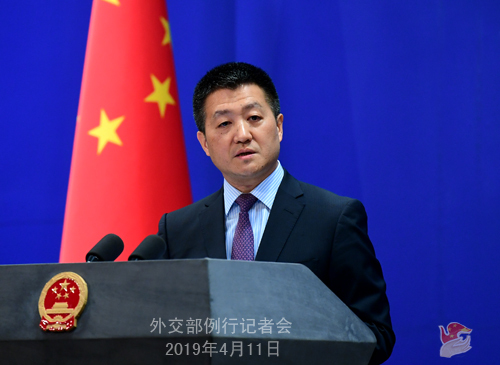 China hopes that the treaty will be extended successfully so as to promote international peace and security. China has committed to not being the first one to use nuclear weapons. We advocate the complete ban and thorough destruction of nuclear weapons and will continue to keep our nuclear strength at the minimum level required for maintenance of national security. China's nuclear policy maintains high consistency and transparency, which in itself is an important contribution to international nuclear disarmament. As countries with the largest nuclear arsenal, the US and Russia have the obligations to earnestly fulfill special and primary responsibility in terms of nuclear disarmament and continue to significantly reduce its nuclear arms in a verifiable, irreversible and legally binding manner in accordance with the consensus of the international community and UN documents including the General Assembly resolutions. This will help create conditions for the realization of final, comprehensive and thorough nuclear disarmament. Q: According to Dutch financial news reports, a semi-conductor producer ASML's Chinese executives have stolen the company's business secrets and that caused huge losses. It is also said that those technologies were leaked to the Chinese government. Are you aware of that? What's your comment? A: We noted relevant reports. In fact, China and the Netherlands have all along maintained good cooperation in science and technology. We have reiterated on many occasions that the Chinese government attaches high importance to the IPR protection. We ask Chinese citizens and companies overseas to abide by local laws. As to China itself, China has not achieved its technological development through theft or robbery. instead, it is achieved with our talent and hard work. Q: According to reports, the 15th round of negotiations on a Free Trade Agreement among China, Japan and the ROK is now underway in Tokyo, Japan. How do you comment on the China-Japan-ROK cooperation at this moment? A: The 15th round of negotiations on the China-Japan-ROK Free Trade Agreement will be held in Tokyo from April 9 to 12. We hope it will proceed smoothly and achieve positive outcomes, so as to lay a foundation for the final conclusion of a comprehensive, high-standard and mutually beneficial agreement. Since the 7th Trilateral Summit Meeting among China, Japan and the ROK in May last year, the China-Japan-ROK cooperation has been advancing steadily and taken on a good momentum. China, Japan and the ROK firmly uphold free trade and vigorously promote regional economic integration. This round of FTA negotiation demonstrates the shared resolve of the three countries to uphold the multilateral trading system and oppose protectionism and unilateralism. In addition, there are trilateral ministerial meetings on telecommunications, environment, transport and logistics, culture, sports, agriculture, central banks, public health and IPR, making specific plans for cooperation. Important events such as the East Asian City of Culture campaign, the Forum on Public Diplomacy and the Trilateral Media Forum have increased the impact of the China-Japan-ROK cooperation and strengthened public support for the cooperation. We are also exploring the "China-Japan-ROK plus x" cooperation model and leverage respective advantages to promote the sustainable development of the region. This year marks the 20th anniversary of the China-Japan-ROK cooperation. It now faces new development opportunities. As the host, China stands ready to work with Japan and the ROK to ensure the success of the leaders' meeting and other important meetings and activities, which will open up new chapter of the trilateral cooperation at a new historical starting point and create a new prospect for East Asia cooperation. Q: Regarding the fifth China-Japan High-level Economic Dialogue, what does China expect to achieve? Will China bring about the issue of China-Japan cooperation in the 5G field and also Huawei? A: The Japanese media has already made some reports on the new round of China-Japan High-level Economic Dialogue, and there have been some remarks made by the Japanese side. We will also release the official information to you as soon as possible. This dialogue is indeed very important, and both sides are looking forward to strengthening communication and coordination. As for the specific areas to be covered in this dialogue, please wait for the information concerning the dialogue. You also mentioned the 5G issue. We have always stressed that in an era of economic globalization, countries have made achievements including the 5G networks through cooperation, which should be shared by all. What the Chinese enterprises have achieved in the field of 5G are accomplished by their own efforts through market-based operation and fair competition. We hope these companies will not be subject to discrimination. All countries should give fair and non-discriminatory treatment to companies from all countries. I believe this is good for China, good for Japan, and good for any economy that participates in and benefits from economic globalization. As for whether this high-level economic dialogue between China and Japan involves this field, let's wait and see. Q: Yesterday the UN Security Council held a closed-door session regarding the recent crisis in Libya. UN Secretary-General Antonio Guterres said after the meeting that there is an urgent need of resumption of a serious political dialogue, but it cannot be launched until the hostilities completely stop in this country. I'm wondering what is China's position on this issue? 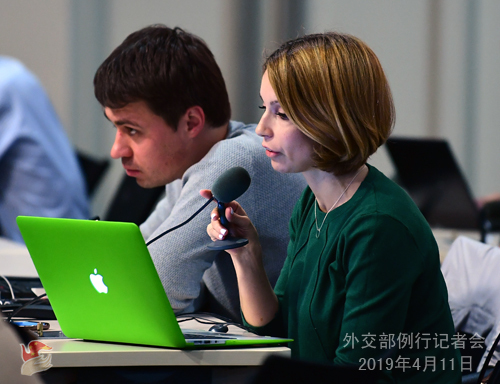 Is China ready to provide any assistance or any proposals as a permanent member of the Security Council to help prevent further escalations in this country? A: Like many other members of the international community, China is highly concerned about the development of the situation in Libya. We always believe that the Libyan issue must be resolved through political means. We hope that all parties to the conflict in Libya will bear in mind the interests of the country and the people and heed the call of the international community to cease fire as soon as possible, ease tensions, return to the track of peaceful dialogue and consultation, and actively promote the political settlement process of Libya under the leadership of the UN. 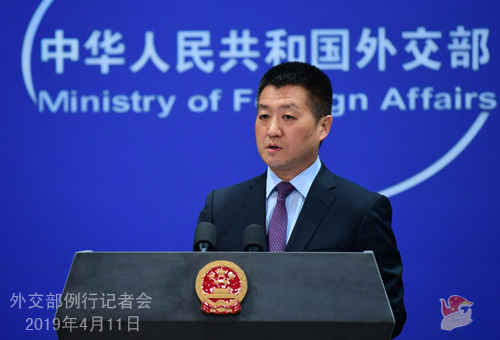 China will continue to work with the international community and make our own efforts for the realization of long-term stability in Libya. Q: According to Australian media, in recent years, the Chinese Consulate General in Sydney has many times issued warnings to the Georges River Council in southern Sydney, asking it to prevent "Falun Gong"-backed media from sponsoring local new year activities. Reports say that China's behavior constitutes an interference in Australia's internal affairs. What is your comment? A: Recently, some Australian media have been trying to fabricate stories of China interfering in Australia's internal affairs, but they do not have any evidence. Now they are even colluding with a heretical cult. "Falun Gong" is a heretical cult and an anti-China political organization that has always been engaging in smearing campaigns against China. It is openly banned by the Chinese government in accordance with the law and rejected by the Chinese people. The Chinese Consulate General warned the relevant country of the heretical nature of "Falun Gong" so that it won't be misled or manipulated. It is completely legitimate and justifiable and has nothing to do with "interfering in internal affairs". Some Australian media, driven by hidden political motives, are bent on launching vicious attacks against China to whip up anti-China sentiments for eye-catching effect. Their shoddy tricks are not that difficult to be seen through. We urge the relevant Australian media to abide by their professional ethics, shoulder their social responsibility, make a clean break with "Falun Gong", and stop inventing China-related issues and attempting to pull the wool over the public's eyes.